The operation of a steel plant requires careful attention to safety, security and safeguards. Security is aimed at preventing intentional acts that might harm the steel plant or result in the theft of materials. Security personnel play a very important role in the steel plant and they are an integral part of the management team. The levels of control required to be provided for security of the steel plant are to be suitable and to meet the threat environment, give proper protection to information, people and physical assets, and to provide assurance to management, employees and various agencies working in the steel plant about safe and secure environment. Fundamental to security is the concept of risk. The risk is ‘a threat or hazard assessed for likelihood and impact’. A threat is ‘an event with negative consequences, brought about through malicious human intent’. A hazard is ‘an event with negative consequences, brought about through natural, environmental or non-malicious human intent’. Steel plant security system is to be based on the physical security mitigation measures to protect people and physical assets on their identified risks. The measures are to reduce the security risks to acceptable levels in the plant by providing minimum controls determined by the impact level of the security risks. Controls needed for the secure operation of the steel plant are to take into account threats which are there both from outside as well as from inside. 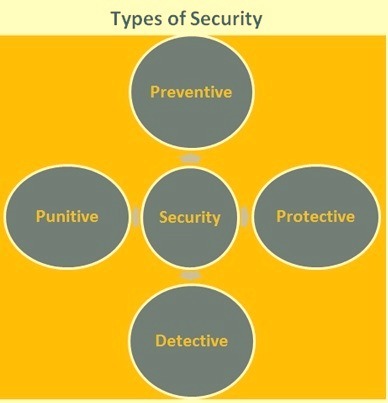 There are four types of security (Fig 1) that are provided in the steel plant. These are namely (i) preventive security, (ii) protective security, (iii) detective security and (iv) punitive security. The security measures in the steel plant are distinguished from the ‘safety’ functions which aim at protection from damages and dangers caused accidently. Like the safety, plant security is also basically a ‘management function’ and it is an essential input which is required for the successful operation of the plant. With technological advancement, steel plant operations have become very complex and there are multiplicities of factors which affect production adversely. Some of’ these factors are given below. The losses and damages which the steel plant may suffer constitute the real threat to the survival of the plant. These threats arise from robbery, criminal trespass, thefts, pilferage, fire, acts of vandalism, fraud, mischievous damage, industrial espionage, subversion, strikes, agitations, civil commotion, riots, other law and order problems, and man-made or natural disasters. A correct appreciation of these real and potential dangers on the part of the management is bound to result in a greater realization of the need for effective security for the steel plant. Due to all the reasons described above, it is essential that a strong and effective security wing of the steel plant is built up, nurtured and looked after very carefully, in the best interests of industrial peace and smooth production in the steel plant. In fact in steel plant, security is an inseparable part of the management right from the very inception, and proper security planning is to be done even at the design stage. Security in steel plants includes the following. Security of assets, premises, and storages and protection against sabotage, espionage and fire. Security of materials (raw materials, in process materials, finished products, stores and spares etc.) along with plant and equipment. Ensuring the entry of authorized persons/vehicles in the premises of the steel plant. Interaction with state intelligence machinery for operational preparedness. Steel plant employs thousands of people. Further a large number of contracting agencies and contract workers are working in the plant. Hence security arrangement in the steel plant must use not only physical means such as fences, walls, gates, and other barriers, but also must employ means to screen all persons entering the gates to determine their right to be on the premises. The extent to which this personal inspection and screening is required depends upon the degree of security that is necessary in order to prevent unauthorized persons from attempting to steal, damage, interrupt or compromise the production processes. The device usually employed at gate to allow regular employees to enter the premises without undue delay is an authorized pass or badge bearing the wearer’s name, photo, employment number, thumb print, plant official’s signature, and other identifying data. Visitors, vendors, contractors, and others desiring to enter the plant on business must first adequately identify themselves before they are given a temporary pass. Standard security gadgets which are normally used by the security personnel include the following. Some of the standard physical security measures include the following. The standard height of the perimeter wall is to be 3 metres with concertina coil fencing of 0.6 metres. The vegetation needs to be pruned at regular intervals. Proper lighting arrangement in and around the perimeter wall is needed especially in night hours. Movement of employees/ contractor/ labourers/ visitors / vehicles is to be regulated at the gates, viz. separate gate for men, vehicles and materials. All vehicles are to be checked for what they are carrying. Regular patrolling by the ‘Quick Response Team’ round the clock. Deployment of personnel in plain cloth for collection of intelligence. Computerized pass system for contractor/ labour and materials- character and antecedents (C&A) verification- a must to prevent any unauthorized element inside the steel plant. The security management function extends to every part of the steel plant and must permeate over all levels in the plant. Instead of aiming at a forcible imposition from the top through inspiring circulars and office orders, steel plant security is to be planned in a manner that it grows from within and extends to all spheres and sections of the plant. The security organization cannot operate in isolation and it must solicit and secure the cooperation of all departments and all employees irrespective of their levels,trade union membership or political affiliations. At the same time, it has to be ensured that security controls do not hamper the operations of the steel plant. On the other hand, these controls are to be devised in such a manner that they contribute to the peak efficiency of the production machinery and the plant operations. Security measures are to be free from harsh and rigid controls, except in grave emergency. Besides, these must be implemented by developing proper security consciousness amongst the employees, including different levels of management. All security personnel are to aim at the proper inculcation of self-discipline among the employees instead of relying heavily on rigid controls. Each employee is to be properly motivated to feel that he is also a part and parcel of the security management, with the only difference that the security personnel work on whole time basis with the full backing of their professional expertise. Leadership in security matters is to be demonstrated at the highest levels of the management in the steel plant and must be achieved by means of an effective management system. In the area of security in the steel plant, the sharing of information should typically be restricted to a small and select group of individuals in order to prevent sensitive information related to protective measures or facility weaknesses from falling into the hands of adversaries. Further, it is also important to take measures to ensure that the knowledge of malicious acts does not encourage similar events. Since the area in the steel plant is very big, the security of the plant is divided into several security zones. Security zones provide a methodology for physical security mitigation based on the security risk assessment. The security risk levels of the securities zones provide guidance in developing the physical security plan for the zone. The primary outcomes of the zones methodology are to provide the needed level of security protection to the area of the zone. Other methodologies adopted for the security management in the steel plant are described below. Threat perception and risk analysis is done keeping in mind the background of the plant location and the local law and order situation. Both external and internal threats are taken into account to draw analysis. Help of local police and other local authorities is taken if required. Regular security audits are carried out on the methods, procedures and practices of security in the steel plant. Adequacy of the system is evaluated during these security audit and loopholes are identified for taking effective corrective actions. Requirement of security manpower and gadgets is regularly to be updated and actions are taken for acquiring the gadgets in case existing gadgets are found to be inadequate. There is to be an optimum mix of men and gadgets without losing the sight of the financial implications. All the existing gadgetry is evaluated and improvements needed along with the new gadgets and their integration is identified. Securities procedures are worked out defining the duties and responsibilities of the security personnel. Threat perception with regard to internal theft of the materials as well as plant and equipment are also given due attention. All the measures required to strengthen the existing system need to be identified. It involves not only physical protection measures but also document security, prevention of leakage of the valuable information and inventory movement. Deployment of manpower and pattern of deployment along with their duties and responsibilities are worked out. Monitoring plan of security guards is also a part of this exercise. Operating procedures for various duty points are made wherever required. An internal audit procedure for evaluating the security systems is developed. This includes exhaustive checklists and analytical formats. An internal intelligence collection system is made wherever required after evaluating the existing systems and activities of various groups working at the establishment. Other security aspects, which need to be emphasized, depend on the threat perception and risk analysis. Another important aspect which is important for the steel plant security is that the security measures must be commensurate with the real and potential hazards involved. Economy in security planning is to be the key to the security management. It is neither economically feasible nor is it administratively essential that every type of security coverage is to be made. The potential and real threat to the steel plant need to be identified and assessed to determine the degree of protection needed and to devise the security measure which are actually required. While devising security measures the twin principle of ‘need-based security’ and ‘security in- depth’ both are to be borne in mind. An integrated security system for the steel plant consists of a series of protection schemes, security techniques, devices and controls which take care of plant layout, sensitive areas of the plant, the topography, environment, demographic factor and all other socio-economic as well as geopolitical aspects. The management and the employees are to have confidence in the security system. Further security system need to be reviewed periodically to ensure that it is functioning effectively.